Did you know that bell peppers are actually perennials? If you thought they were annuals then like me you probably live in an area that gets frost and snow in the winter. I discovered that bell peppers were perennials as my interest in gardening grew. 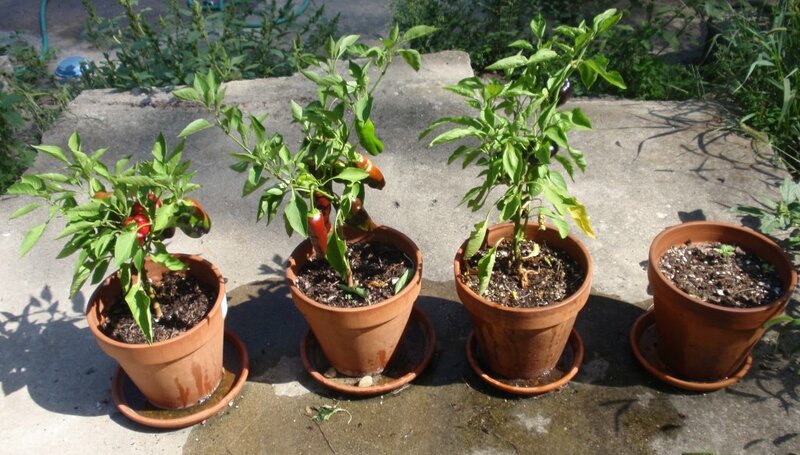 The frost will kill bell peppers, but if you over wintered the plants indoors you can replant them next spring. I’m having my best pepper year ever this year. I tried two new varieties of bell pepper this year, the purple beauty and the sweet chocolate. Seed savers had this to say about the purple beauty. Holds in the purple stage for some time before ripening to a radiant purple-red. Radiant red indeed. If you look at my pictures you can see how red they get. I like to wait until they change colors before picking so that I know they are ripe. I plan to bring these inside for the winter. If I can keep them alive until next spring, my harvest of bell peppers should be even better. You may have noticed that one of my pots is empty. 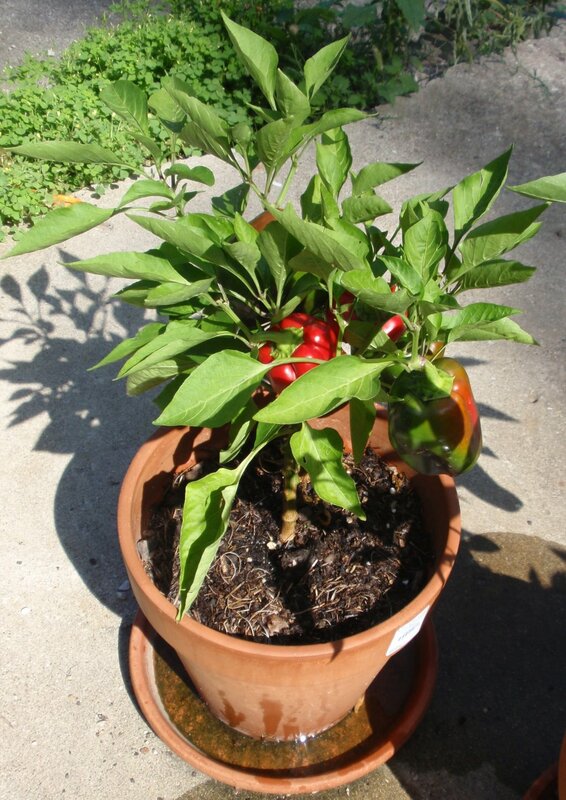 This pot contained another sweet chocolate bell pepper. This plant was damaged during a bad thunderstorm that knocked out power to my house for eight hours. It was leaning over badly but I left in the pot hoping the peppers would ripen. 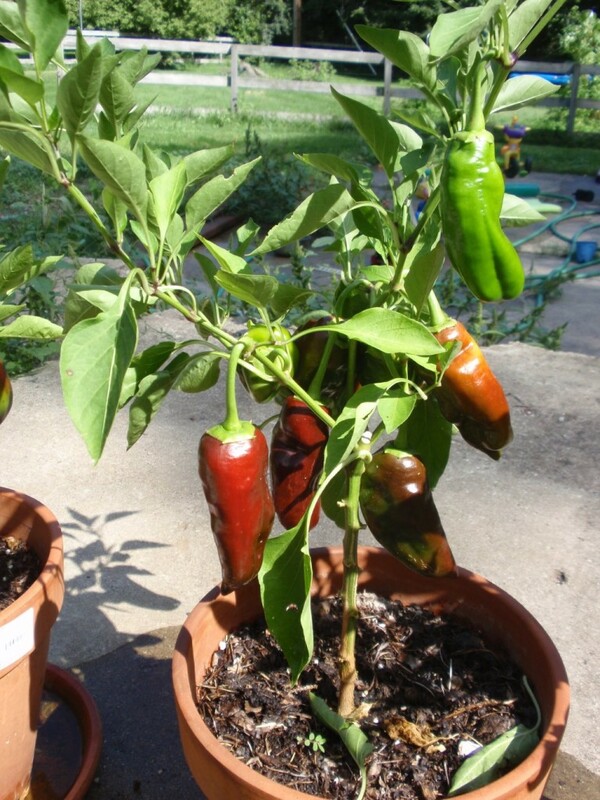 When I went out to water it one morning I noticed that it had been completely stripped of its leaves and the developing peppers half eaten. I decided to pull it out and throw it in the compost pile. When I did so I found a huge tomato horn worm that had dug into the dirt to pupate after defoliating my bell pepper plant. The chickens enjoyed that fat juicy caterpillar. Purple Beauty Bell Peppers turn bright red.